You have the satisfaction of knowing the AquaShield is the safest, most effective cast and bandage protector available. 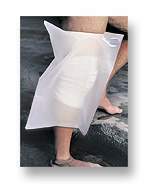 It has been used daily by hundreds of thousands of patients for bathing, showering and swimming (some as long as four years) without a tear or leak. The AquaShield has been manufactured by Orthomed Products, Inc. in California since 1988. Your professional wholesale price offers a substantial discount from the patient’s price, and better pricing is available when purchasing by the case (10 units). We encourage offices and hospitals to stock AquaShields and provide them directly to the patient. We support you with a brochure entitled “Cast Care and your AquaShield” which helps your patient understand his or her fracture, its healing process and the dos and don’ts about cast care. (See the Cast Care Tips section). If you prefer not to stock the AquaShield there are alternatives. Ask your local medical supply store or pharmacy to set-up an account with us or we can provide your office with end-user pricing forms for your patients to order directly from our manufacturing facility in California. If you wish to receive a sample and wholesale price list, please submit the following form. Are you presently using another cast protector?